The full name of Virender Sehwag is born in 20 October 1978 in Delhi, India .He is also known as Veeru.His Father's name is Krishan Sehwag and mother is also Krishan Sehwag.Virender Sehwag Wife Name is Aarti Alhawat and he has one son's Aryavir. Virender Sehwag is right handed Opening batsman. He started his cricket career with Delhi cricket team in first class cricket in the 1997–98 season.In April 1999 Pakistan One Day cricket international debut by Virender Sehwag but fail to give good performance.Virender Sehwag One Day cricket international debut begins with poor performance but later on he come back with some amazing batting performances.In March 2001 In the fourth match Virender Sehwag was heating 58 off 54 balls and taking 3 wickets against Australia in Bangalore.In this match he success to received the first Man of the Match award. Virender Sehwag made his test debut in the year 2001( South Africa in Bloemfontein) . He is one of only three players to have managed two scores over three hundred runs in a single round of play in this form.Virender Sehwag scored his first triple-century in Test cricket in 2004 against the Pakistan (309 runs ) and his second in 2008 against the South Africa (319 runs ). This is also fastest triple century in Test Cricket. Sehwag is the only player with Donald Bradman and Brian Lara to have passed two triple-centuries at this one .Now the best and most destructive batsmen in world cricket . The only Indian to have achieved a triple century. Two consecutive double century partnerships in one innings. 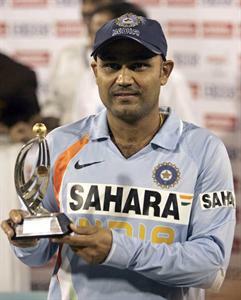 Sehwag had scored a world record double century in fourth ODI against West Indies. This article gives you complete details about Sehwag's stunning 200 and details about the fourth ODI where India wins the match and takes the series against West Indies. Read the article full for more details. The Dashing Indian opening batsman Virender Sehwag made world record double century against West Indies. He becomes the 'Highest Runscorer in an ODI innings' and Quickest Double Century hitter in ODIs.